Spray foam insulation is a great option for making your home more energy efficient by creating a seamless monolithic air barrier. This seamless air barrier will allow you to maintain a consistent and constant comfort throughout your home regardless of what mother nature throws you. Here are some more benefits. When applied by our highly trained foam technicians, the foam will expand to fill the smallest crack or crevice. This seal along with the proper AC equipment will give you the ability to choose and maintain a comfortable humidity level within your home. This is something that has never been achievable with conventional insulation with the reason being hot moist air could meet cold dry air leading to elevated moisture levels. Now with the advancements of spray foam hot air and cold air will never meet and you can now maximize newer ac systems customizing what humidity level is most comfortable for you regardless of exterior conditions. If you have ever experienced rooms in a home that were hotter or colder than other parts of the home, you’ll be excited to hear that condition is eliminated with spray foam. There are two reasons why, one is the foams incredible resistance to heat gain stopping radiant heat from penetrating walls and secondly the monolithic air barrier that creates a consistent temperature throughout the home. Whether you live in a cold climate or a hot climate a drafty home is an uncomfortable home and is one of the leading causes of higher energy cost today. Spray foam technology gives us the ability to encapsulate the entire home sealing all penetrations and to make the attic a conditioned space. This allows us to capture all the heating and cooling normally lost through exterior walls and harsh vented attics making for a much more comfortable home while putting more money in your pocket every month. If you or someone in your home suffers from allergies, asthma or other respiratory conditions, the installation of spray foam insulation can help to reduce your symptoms. The seal created by the insulation prevents pollen, dust and other particles from the outdoor air from entering your home. 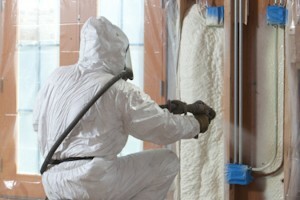 To learn more about Spray Foam Insulation, contact USI online to request a free quote. USI believes that excellence in every step of the process ensures timely completion and quality service, time after time. ← Where should I insulate my home?